Aaaaand…we’re back to another soup recipe! But hey, it’s still winter, and I feel like I’d be letting you down if I didn’t supply you with plenty of warm, one-bowl-meal options. 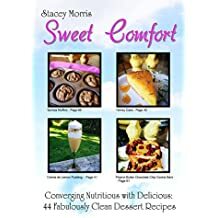 This recipe is from my third cookbook, “A Bowl of Comfort: Soups, Dips, Sides, and Desserts – 44 Clean Reinventions.” Since there’s nothing I like more than food served in a bowl, why not make an homage to it with a cache of clean recipes? This soup recipe was given to me when I was a reporter for a daily newspaper in upstate New York back in the ’90s. As a food writer, it was my job to showcase our seemingly homogeneous community’s ethnic diversity through recipes from around the world. Viorica ‘Lily’ Dinu was a woman of remarkable character and one of the best cooks I’ve ever encountered. She baked like a trained pastry chef, churning out delectable cakes and mousses on instinct, no recipe required. And she also made unforgettable soups. 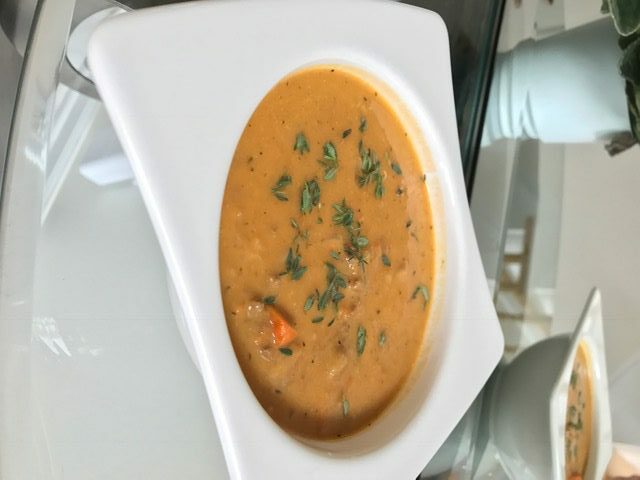 One night a few weeks ago, while rifling through my recipe clippings, I came across Lily’s Romanian meatball soup recipe. Alas, all I had available was leftover ground beef. So I improvised, and the result was STILL delicious. As always, I subbed chevre for the sour cream called for. It works like a charm. A full-bodied, comforting soup that's one of my favorite meals. Pour stock into large stockpot and begin heating on medium high heat. While stock is heating, dice carrots and onions in a food processor in batches. Drop each finished diced veggie batch carefully into the simmering stock. Add red pepper and shredded cabbage and let the soup simmer covered for 20 minutes, stirring occasionally. Then let it simmer 20 minutes uncovered, or until vegetables are soft. During the last 10 minutes of uncovered simmering, add wine and mix well. Add celery salt and thyme and stir thoroughly. Turn heat off and let cool for 10 minutes. Puree ¾ of the vegetable soup mixture in a Vitamix or blender and add back to pot. Turn heat on medium-low and add ground beef and chevre. Heat until lightly bubbling and hot, stirring occasionally. Serve immediately. This soup sounds wonderful ! Easy too! I’m going to give it a try…. thanks for posting the recipe. It’s one of my new favorites, Sandra! Forgot to mention, to my Vegan and Vegetarian friends, simply omit the beef and throw in diced potatoes. The more colorful the better. I love the purple ones, red too, but it’s all good. Looks fabulous and I can’t wait to read the third book, Stace!! !